I’ve got to give some love to all the gingers out there, especially with all this Kick a Ginger non-sense. 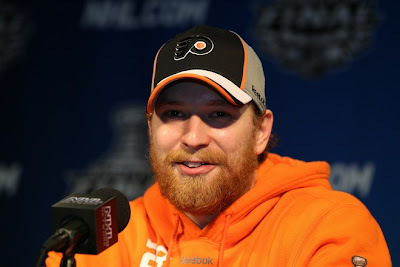 Not only is Giroux tearing up the playoffs as a sophmore, but he's got a glorious beard that Sidney Crosby dreams of. 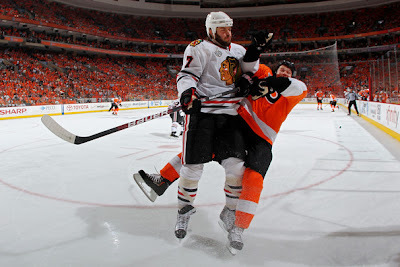 Giroux is like a super ginger when the Flyers play in their home orange. Thick and fiery, just like Groundskeeper Willie. This is the first time that Thornton has made it far enough in the playoffs to sport anything more than a thick 5 o’clock shadow. 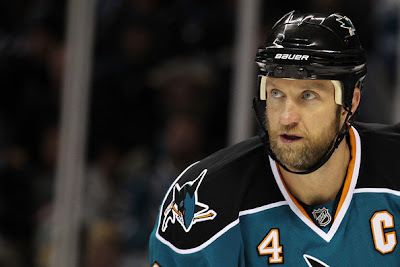 He very narrowly edges out teammate Patrick Marleau for the centre position, but Joe’s been battered by critics for so long that it’s nice to give him some sort of playoff award. It's not like he's going to win a Conn Smythe anytime soon. Gagne is doing his best to disprove the stereotype that centuries of Quebec in-breeding has caused genetics that only allow men to grow beards that come in like Max Lappiere and Danny Briere at best. Too far? This spot was supposed to be for Brian Campbell, but there are absolutely no good pictures of Campbell on the net, which suggests that he has done nothing over the Stanley Cup Final. I seriously went through 300 pictures on NHL.com (yes, I'm a lunatic). Plus, that would be way too much love for the gingers. Don't want to give them too much self-confidence. Campbell is lucky I didn't replace him with Brent Sopel's Mexican drug dealer beard. Blake is definitely the elder statesman on the team which definitely gives him the edge over his younger counterparts. You expect Old Man Blake to bust out a good beard. Thankfully for Blake, his beard doesn’t age him as badly as Scott Niedermayer’s salt and pepper did. The goalie position was harder to pick. Ryan Miller started growing his beard earlier than the playoffs, so he doesn’t count. Roberto Luongo was so shaken by the Blackhawks that he actually shaved his playoff beard. And Chris Mason and his woolly mammoth were not in the playoffs. It basically came down to Niemi and Leighton. We’ll give the nod to Niemi since he’s played every game this post-season. Scott Hartnell needs to be on this list. Between the beard and the hair, he looks like a freakin' mountain man. Pretty much every Flyer except Chris Pronger and Brian Boucher have massive beards. 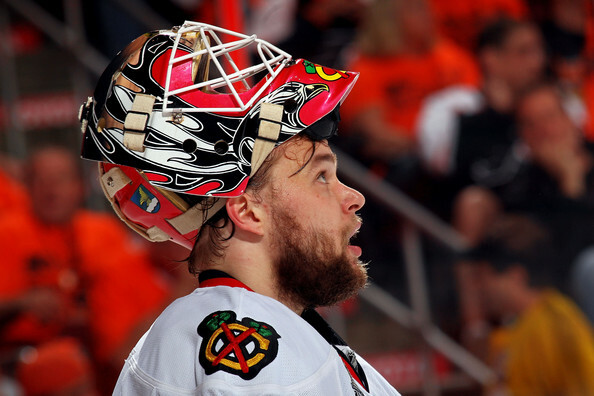 That team takes playoff beards REALLY serious. Also, Leino was originally tabbed for a winger spot, but after close inspection he's kind of patchy on the sides. Although, he is rocking a totally metal goatee area. And if I was to give an award for team with the best beard the Flyers would win handily. No mention of the Johnny Toews mutton-chops?! 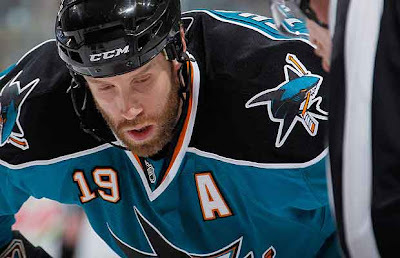 Also, Hartnell should take the Mike Commodore Award for ugliest beard/hair combo.